This 3-D image of Pluto, which requires red/blue stereo glasses for viewing (click the picture for a full-screen version), shows a region 180 miles (300 kilometres) across, centred near longitude 130°E, latitude 20°N (the red square in the global context image). North is to the upper left. The image shows an ancient, heavily cratered region of Pluto, dotted with low hills and cut by deep fractures indicating extension of Pluto’s crust. Image credit: NASA/JHUAPL/SwRI. Global stereo mapping of Pluto’s surface is now possible, as images taken from multiple directions are downlinked from NASA’s New Horizons spacecraft. 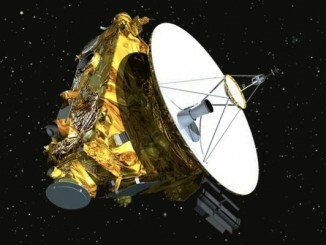 Stereo images will eventually provide an accurate topographic map of most of the hemisphere of Pluto seen by New Horizons during the 14 July flyby, which will be key to understanding Pluto’s geological history. This example, which requires red/blue stereo glasses for viewing, shows a region 180 miles (300 kilometres) across, centered near longitude 130°E, latitude 20°N (the red square in the global context image). North is to the upper left. 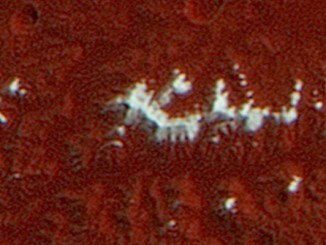 The image shows an ancient, heavily cratered region of Pluto, dotted with low hills and cut by deep fractures indicating extension of Pluto’s crust. Analysis of these stereo images shows that the steep fracture in the upper left of the image is about 1 mile (1.6 kilometres) deep, and the craters in the lower right part of the image are up to 1.3 miles (2.1 kilometres) deep. Smallest visible details are about 0.4 miles (0.6 kilometres) across. 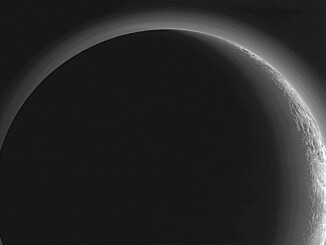 In September, the New Horizons team released a stunning but incomplete image of Pluto’s crescent. Thanks to updated processing work by the science team, New Horizons is releasing the entire, breathtaking image of Pluto. The team also released images showing extended mapping of the dwarf planet’s “heart” feature and young craters on Pluto’s largest moon, Charon.